Due to a personal project, I had to shorten my Harper’s BAZAAR internship down to two months from the original three. I know it is too short to gain serious experience but it has been an eye-opener for me, considering that this is my first ‘job’ and that I had never stepped into the fashion industry before. I am pretty satisfied with my involvement and my role. No coffee runs or cleaning-ups. Mostly what I have to do is running errands (loads of moving around in a cab), tidying their stuff, preparing for a photoshoot and occasionally, I wrote for them. I was also given the chance to meet many different people in the industry. I got to say it is very rewarding interacting with them. Through all these, I saw that eveything is very fast paced and I need to be very alert all the time. Sometimes I have to figure out problems on my own but from that I know how to pull through difficult situations, think quick and handle matters properly now. What keeps every moment interesting is that no one will know what is going to happen next. When something goes slightly wrong or a new idea pops up— the plan changes faster than you know it. All I can say is that, after this stint at BAZAAR, my respect and admiration for people of fashion have grown much more than I used to. I remembered once when my fellow intern asked the stylist after wrapping up a very hectic photoshoot— ”so what drives you to keep going?”, she replied ”I just love all things fashion”. Their passion is crazy. Doing a Lauren Conrad— me, in an Alexander Wang jacket and my own 3.1 Phillip Lim dress (yes I support asian designers from New York). 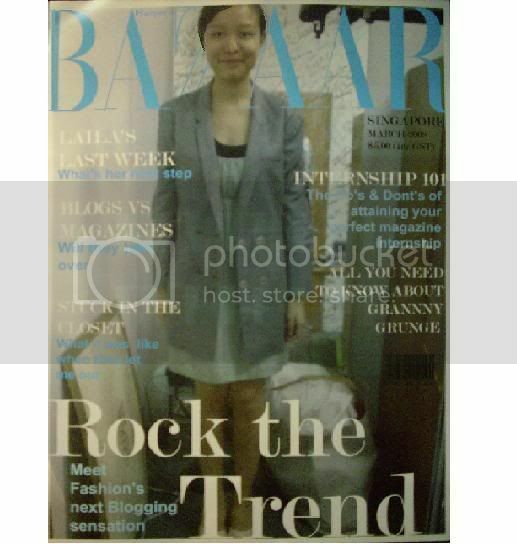 Lastly, I would like to thank Harper’s BAZAAR Singapore, Alli Sim, Windy Aulia and my fellow interns— rock on people. CONGRATULATIONS!! !, Sister on your foray into the FASHION WORLD. Continued Success to you!! Felicitations Cheryl!S’pore fashion will never be the same again with your new-found eye opening experiance and perspective view.Come on lah,why not do an asian version of V and call it A ? LOL! Good luck lah! heyyysss read that ure gonna be a fashion student soon rite?where are u studying? Hey thanks for the wishes. I stalk around your blog all the time, this sounds really exciting! I meant LAILA of course.Congrats hun!I guess Cheryl did fun cover.Great job girl! You’d better FRAME the cover and hang it on your wall or smt. Well done! It’s impressive to know enthusiastic people still exist! Keep it up, don’t let the world get you down! (or if it does, like Cheryl said – frame the cover and look at it when sad) Great things are done with passion! well done on the internship, bring some fresh fashion flair to the UK next!